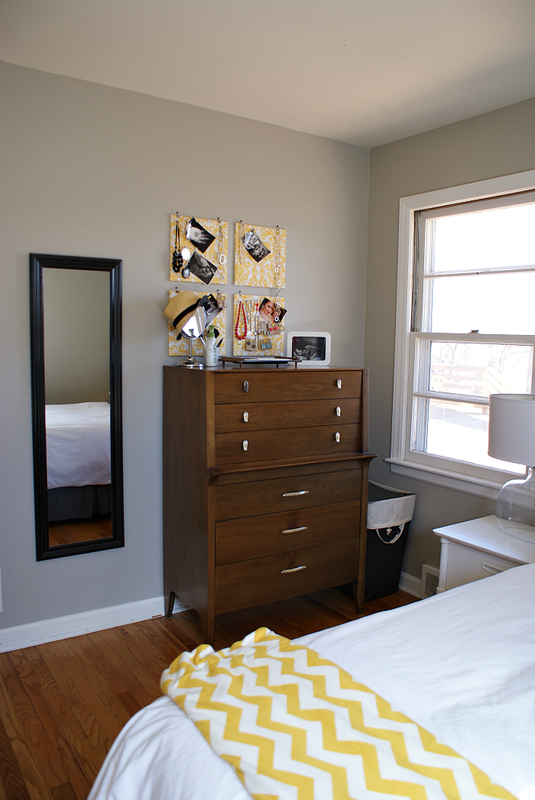 I recently updated our humble little bedroom with a gray, yellow and black color scheme. 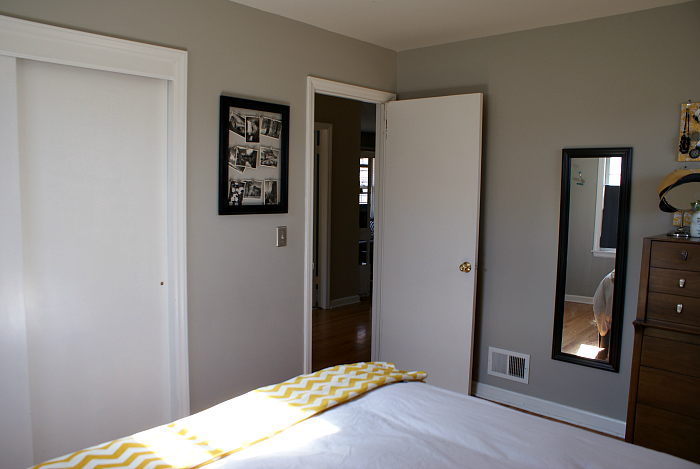 It's not a gigantic master suite but it's comfortable, cozy and reflects our tastes. I love the way it turned out and the best part is, the whole update was under $400! 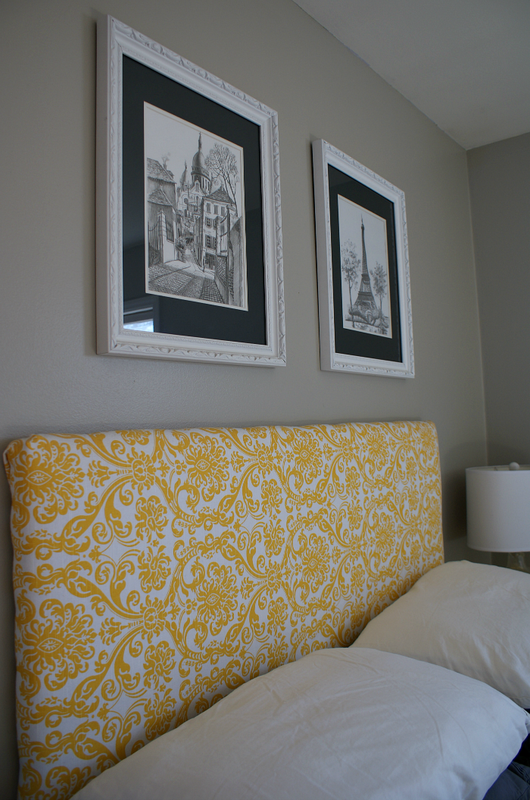 I love this upholstered headboard because I can easily recover it when my tastes change (in a month or two, HAHA). For this project, Jesse cut a plywood board for me and then I stapled quilt batting to the headboard, followed by this gorgeous yellow and white damask. Jesse then mounted it on the wall using a French cleat (really need to do a tutorial on how to make this). For this jewelry organizer I used leftover fabric from the headboard project and stapled it to cork board squares from the office supply store. Then I clipped simple binder clips to the cork boards and screwed the clips to the wall. Finally, I added some push pins and voila! An inexpensive, cute and functional jewelry organizer! This little danish modern tray was a Goodwill find. I usually put my watch, wedding ring and the day's earrings in it before bed. By the way, I love vintage costume earrings; they just make a girl feel fabulous. I also wanted to share this thrifted wall frame turned post card hanger because it gave me a way to display my beautiful Ansel Adams post cards (another estate sale find - three bucks!). I started with a solid wood frame at a thrift store on my way home from work for $8. It originally had a dingy brown stain so I primed and spray painted it black. Jesse helped me wrap bailing wire around screws on the backside and I used binder clips from the jewlery organizer project to hang the post cards. A few things aren't listed because we already owned them before the project, I figure they don't count towards the makeover budget. If you're curious about something, give me a shout! 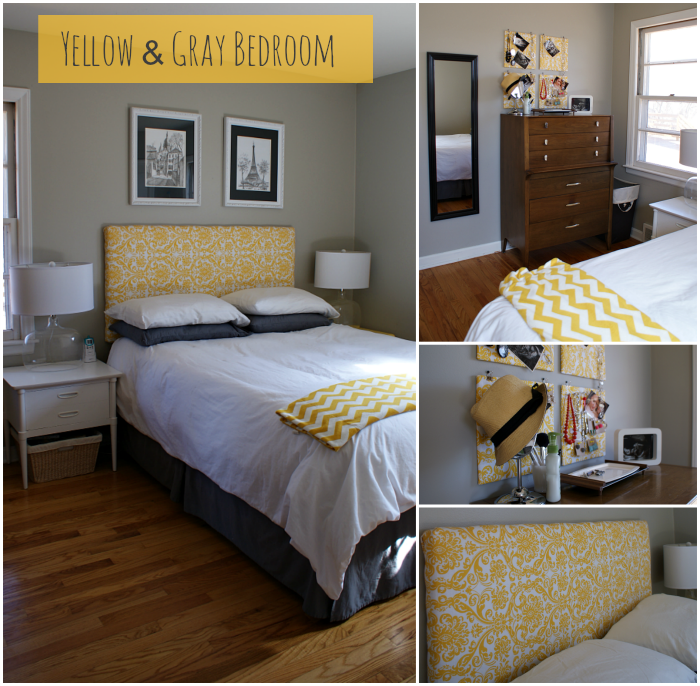 Lovely bedroom with just the right amount of that yellow! I've been wanting to do a headboard. Yours is awesome! I'd love for you to come link up at The Makers! We will be picking a blogger to feature at next weeks party and the collection closes tonight. So come link up! Hope to see you there.